Colormania is an advanced color picker utility, especially created for web-designers, graphic artists and application developers. It supports various color models and is able to pick colors from anywhere on your screen. Accuracy on pixel level is even made easier with the built-in screen magnifier. 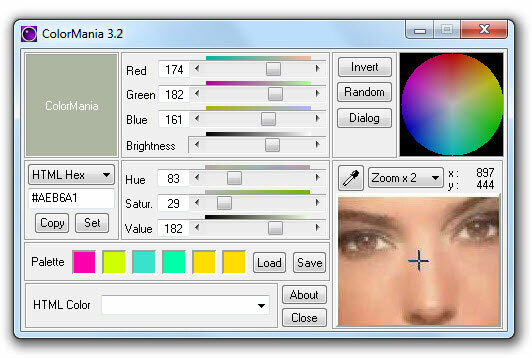 Colormania is an advanced color picker utility, especially created for web-designers, graphic artists and application developers. It supports various color models and is able to pick colors from anywhere on your screen. Accuracy on pixel level is even made easier with the built-in screen magnifier. - Building a website and want to get your colors right ? - Working with graphics and need a detailed view ? - Need accuracy in your work when identifying colors ? ColorMania is a standalone color picker, but it is also integrated as a color dialog in some of our other products, like our font manager X-Fonter and our text effects program Texefex.